« Library staff should come as Standard. England’s libraries and the funding crisis – American Libraries (USA). Phil Bradley summarises the situation so far. Salford – Working Class Movement Library under threat. “I fear for the sadness of my little boy should his beloved Balby library close. We spent about 2 1/2 hours there today. He would play with the toys then take a break and select a number books for me to read to him then play again using what I had just read as inspiration for his games. It filled me with Joy and also great Sadness when he said ‘ I really like the library’…” Doncaster library user – Walk You Home. 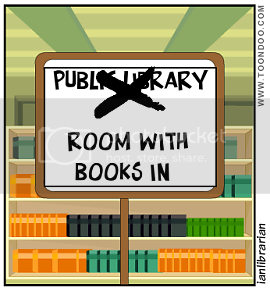 Doncaster – Real alternative to library closures – Save Doncaster Libraries. “The Cabinet may decide to remove funding from libraries where they think the community has a chance of keeping the library open – we would strongly urge the council not to do this, because volunteer libraries are unsustainable and nowhere near enough planning has been done to ascertain if the libraries would even last a few months outside of council control. If they fail before March 2012, any efforts to find money to save them in the next financial year would be pointless.”… Labour Group (many of whom campaigned to keep libraries open) and others could find enough money. “RT @streathamlib: Public consultation on Lambeth Libraries – TONIGHT @ 6pm Woodlawns (a terrific #assettransfer project)” Lambeth – Asset Transfer Unit (Twitter). Salford – Working Class Movement Library in pictures – Guardian. “The venerable archive in Salford is under threat after the local council reduced its funding. The library’s collection of books, trades union documents and other artefacts dates back to the 1780s.”. Suffolk – Consultation – Suffolk Council. Consultation started 6th September. Surrey community “has gun to its head” on libraries, says opposition group – Guardian series. ““The report highlights that there are many unresolved issues in the county’s proposals, as a result communities can’t complete business plans when they don’t know the financial basis upon which they will be operating.”… “I went to Peru and was able to go to an internet cafe there. If the library closes, it will mean the Peruvian jungle has better internet access than Hersham.”. Identical article also in Surrey Comet. Print article This entry was posted by Ian Anstice on September 7, 2011 at 9:15 pm, and is filed under Uncategorized. Follow any responses to this post through RSS 2.0. You can skip to the end and leave a response. Pinging is currently not allowed.